Trump promised to save jobs in Michigan. He lied. Trump’s back in Michigan tonight, and he’s hoping the people of Michigan have forgotten his false promises from the 2016 campaign trail. Lucky for him, we haven’t, and we put together a highlight reel of Trump’s biggest lies to prove it. 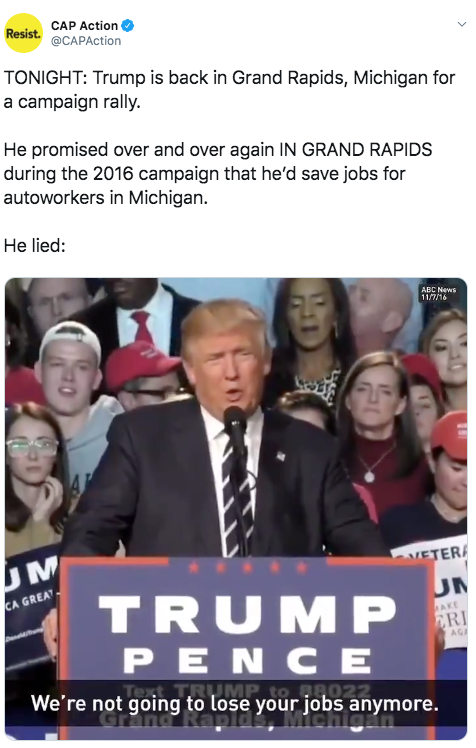 Ahead of Trump’s campaign rally in Grand Rapids, Michigan, share this video on Facebook and Twitter to make sure he can’t get away with more lies. You can bet that Trump will perform his usual stump speech of self-praise and attacks on Democrats. He’ll peddle more lies about his “accomplishments” and (wrongly) crow about how the Mueller report exonerated him (it didn’t). His repeated false promises to save jobs in Michigan. Or the fact that he chose to give General Motors massive tax cuts instead—and did nothing to help autoworkers as plants started closing. The $1.3 BILLION his regulatory rollbacks are taking out of Michigan families’ wallets. It’s time for everyone to start calling out Trump’s lies. Share this video on Facebook and Twitter to help get the facts out. Today, we learned that Special Counsel Mueller’s final report to the DOJ was over 300 pages long. That makes Attorney General Barr’s 4-page summary look even more inadequate—and unacceptable. On this week’s episode of Thinking CAP, Popular Information founder and former ThinkProgress editor-in-chief, Judd Legum, helps break down the fallout from the non-release of the Mueller report and the spectacle that has consumed the nation for the past week. Listen here.